TPL Equestrian are excited to announce that we will be sponsoring Mounted Games rider Maliecha Barclay during 2018. Hi my name is Maliecha Barclay and I have been competing in Mounted Games for nearly 18 years, I really enjoy being part of a team. I have ridden for my county team of Hereford & Worcester for 16 years of which we competed at major shows up and down the country and we were very successful with numerous wins and placings. We also exhibited at the local Three Counties Show in Malvern many times. 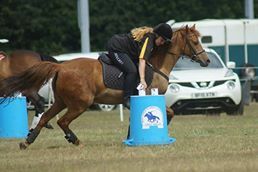 Riding within the Mounted Games Association of Great Britain has taken me to some superb venues including Blenheim Palace, Chatsworth House, Holkham Hall, Royal Welsh and many more county shows throughout the country. For the past 2 seasons I have ridden for the County of Kent as they are slightly older riders although we are still a very competitive team, however, we have a more laid back approach to the very athletic discipline of mounted games. I have a very full season ahead in 2018 with over 15 shows at Shrewsbury, Newark, Chepstow, The New Forest showground, Leicester, Dorset, Stoneleigh and a new show this year at the Cotswold Game and country Fair. My current pony Jazz is a very lively 13hh Welsh Section B who I have trained myself and we have a very strong bond together as with Mounted Games which is ridden at such a fast pace you really do have to have faith in each other and your team mates and their ponies too. Keep an eye on our blog for posts and updates on Maliecha and Jazz's competitions during the 2018 season!